On 16th May 1896, Dublin's first electric trams began running between Haddington Road and Dalkey. Initially operated by the Dublin Southern District Tramways Company, the line was sold a few months later to the Dublin United Tramways, at that time running about 170 horse cars over 33 route miles. Despite concerted opposition, a reconstituted Dublin United Tramways Company (1896) Ltd. immediately set about total electrification. This was completed in four years and when the last horse tram ran on the Bath Avenue line in January 1901, the Dublin area had about 66 electric route miles, of which nearly 50 were owned by the DUTC. Over the next decade, the Dublin system became a world leader, pioneering several developments that were later adopted universally. Until very recently, a town's buses and trams were as readily identifiable as its architecture. Recognisably indigenous vehicles operated in most cities and a Belfast bus would look as out of place in Cardiff as Big Ben would in Edinburgh. Trams were especially distinctive, and every one of the four generations of Dublin trams - Open-top, Balcony, Standard and Luxury - was as characteristic of the city as the Custom House or the Halfpenny Bridge. The DUTC management and staff took a special pride in their trams, built at Spa Road Works in Inchicore. They were among the best running anywhere, the bogie cars built for the Dalkey line from 1906 onwards being particularly noteworthy. Before World war One, some of these 71-seaters with open balconies at each end of the top deck operated limited stop services each morning and evening. At locations like Ballsbridge and Booterstown, ordinary service trams had to change tracks while the expresses sped past, their journeys having one length over which they ran for nearly four and a half miles non-stop - something which would be absolutely impossible today. Car design improved continuously, and shortly after totally enclosed Standard Saloon four-wheelers appeared in 1924, the Dalkey balcony design quickly evolved into a bogie version. During the mid-twenties the DUTC's first two totally enclosed bogie trams (Nos. 218 and 224) appeared on the Dalkey (No. 8) line. These combined design features of the four-wheeled Standard Saloons then being built with those of the last balcony (Windjammer) bogie cars of 1924. For the re-opening of the Lucan (25) route in 1928 nine similar vehicles were built at Spa Road (Nos. 181, 184, 252-255, 278, 284 and 314). A twelfth bogie Standard was created by rebuilding a 1906 balcony car (No. 313). Following the abandonment of the Lucan line in 1940, the Bogie Standards were transferred to the Dalkey route where they ousted some older vehicles. No. 313 was scrapped in 1944, but the other eleven worked until 9th July when what had been the first electric line in the city became the last to close, leaving only the Hill of Howth in operation. The last Dalkey tram was Bogie Standard No. 252. Following abandonment, most of the tram bodies were sold off. No. 253 became a sewing classroom and, later, sleeping accommodation (with four self-contained bedrooms) at St. Joseph's Convent, Tivoli Road, Dún Laoghaire. In the event of over-booking at weekend retreats, nuns would move into the tram, releasing dormitory space in the convent. Eventually falling into disuse, No. 253 remained at Tivoli Road until June 1987 when it was donated to the museum by the Sisters and moved to the CIE complex at Broadstone. In December 1987 the tram was brought to the FÁS workshops at Broombridge and completely rebuilt, its restoration funded from the National Lottery. 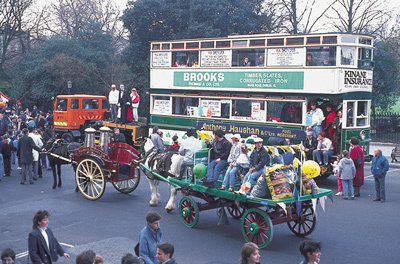 It made a joyous return to the streets in the 1990 St. Patrick's Day Parade. Since then, it has stood on temporary bogies awaiting suitable running gear; new seats will also have to be fabricated. Livery is Audley green and cream with olive green on the cantrail panel. There are honesty boxes on each platform. No. 253 was used twice by the Dublin Transport Initiative to publicise improved transport arrangements for Dublin: in February 1993 at North Earl Street and in November 1994 at the Royal Hospital, Kilmainham. Another of these cars, No. 284, is in store awaiting rebuilding as a balcony vehicle. No. 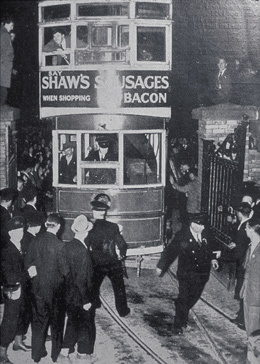 252, the last tram to run in Dublin, needed police protection from souvenir hunters on its last trip to the Blackrock Depot.